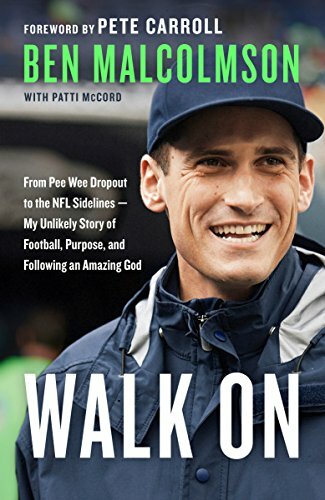 In this true, compelling account of perseverance and hope from Seahawks Coach Pete Carroll's assistant, a young journalist walks on to a top-ranked USC football team and, guided by his faith, shares God's love, launching him on an unexpected journey with an amazing outcome. Had anyone told Ben Malcolmson that he'd someday be a wide receiver on the national champion USC football team--after not playing football since an unfortunate fifth-grade Pop Warner experience--he would have called them crazy. As a reporter for The Daily Trojan, in the spirit of George Plimpton, he participated in walk-on tryouts for the team and was dumbfounded to find himself listed on the roster. His position on the team never amounted to much in a game-time contribution, but Ben felt strongly that his faith was inextricably linked to his purpose. He felt called to anonymously place Bibles in each USC teammate locker on Christmas Eve--to resounding indifference and rejection from his friends. It wasn't until three years later, when his role at USC had led to a role with Coach Pete Carroll at the Seahawks organization, that an old friend connected with Ben and told him that one of the Bibles had captivated the heart of a teammate in the three days before his death.